Wisco 561 Digital Pizza Oven-Free Shipping! Allows you to easily set the temperature with a turn of a dial. Features 30 minute digital display with "HOLD" option. LED display. Best when operated on an individual branch circuit. 4.5 power cord length. 5 out of 5 stars - Wisco 561 Digital Pizza Oven-Free Shipping! 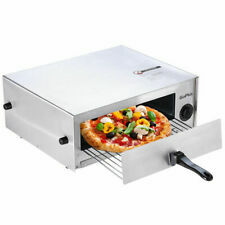 1 product rating1 product ratings - Wisco 561 Digital Pizza Oven-Free Shipping! This Is Our Excellent Stainless Steel Electric Pizza Oven Which Can Bake The Finest Quality Frozen Pizza, Cheese Breads, Pretzels And More. Don't hesitate to buy one! Can Cook Pizza Up To 12". Never Operate The Pizza Baker Oven Without The Crumb Tray And Food Rack. The Uuni Pro is the perfect addition to your outdoor kitchen!We're HotTo make truly great pizza, you need real heat. Ooni pizza ovens reach 500˚C/932˚F in as little as 10 minutes, and cook restaurant-quality pizza in 60 seconds. Condition is Used. Needs stones and could use fresh tiles on the front to Match whatever style of kitchen or dinning room. Works great we bought for a pizza place we never opened. Taking up space must go. WPPO Wood Pellet Pizza Oven. Wood Fired Pizza! WPPO Portable Wood / Charcoal Fired Pizza Oven. Includes Complete Cooking Kit. WPPO Oven, Cover / Carry Bag, Cutter, Peel, Pan and ladle. Be a Pro Pizza Chef Anywhere You Go. Nothing compares with this Oven at this Price point. Bakers Pride BOCS Countertop Double Deck Electric Pizza Oven. Bakers Pride countertop pizza oven tested and in working condition. Bakers Pride Oven. Espresso |Gelato |Granita |Panini |Pasta. Condition is New. The Pizza Oven Box's patent pending design raises the temperature of outdoor grills to that of a real wood burning pizza oven. Unmatched baking performance is achieved by combining convective, conductive and radiant heat to quickly and evenly bake a variety of foods. WPPO Wood Fired Garden Oven. Includes Pizza Stone. From Wood Pellet Pizza Oven. WPPO Backyard Garden Oven. Includes Pizza Stone. Cook your Favorite Baked Dishes with Wood or Charcoal Fire in your own Back Yard. The stones are in good shape with no cracks. This is the perfect little oven for anyone with a lack of space. 60,000 BTU, Natural Gas. We strive to provide an accurate representation of our products. Uuni 3 is the definitive tool for your garden or outdoor kitchen. It’s designed specifically to take the cost, bulk and hassle out of using a wood-fired oven. The patent-pending oven runs on wood pellets which are very energy-dense and inexpensive. Great for your kitchen, dorm room, camping, and tailgating parties. Preheats in minutes. Cook pizza, quesadillas, cookies, and more. Removable pull out crumb tray to clean with ease. Professional series durable stainless steel body with cool touch handle with fit nicely right on your kitchen countertop. 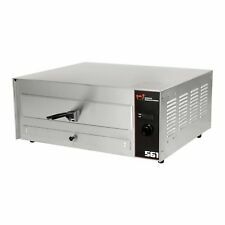 Waring WPO500 Single Deck Countertop Oven (for Pizza, Bread, etc) - 120V Ready! 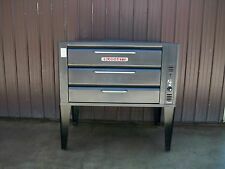 Wisco Model 421 Commercial Counter Top Digital Pizza Oven - 12" Pizzas & more! Wisco Industries Model 421 Digital Pizza Oven. This is not your typical pizza oven. Not a problem! Our new rotary dial design allows you to easily set it at what you need with just a turn of the dial. Bakers Pride Conveyor Oven. 18"W Conveyor. Pizza Ovens are Expensive! Build your Outdoor Wood Fired Pizza Oven and Save! The Mattone Barile Grande is our Texas-sized outdoor pizza oven kit that is the ultimate in DIY wood fired pizza ovens! It's just that easy! As our most popular oven model, the Mattone Barile Grande pizza oven foam form has helped thousands of people all across the globe quickly and easily build the perfect brick pizza oven! At the bottom, there is a fire tray which is suitable for all types of charcoal and firewood, except sap-rich firewood made from evergreens which should never be used in wood-burning ovens! The fire tray is removable, allowing for quick and easy cleaning. Blodgett Single Deck Pizza Oven. Includes stones and heavy duty legs. Blodgett Conveyer Pizza Oven.Single Phase Gas.Sold for parts or repair.